In March 2010, we enjoyed a superb 12 day visit to Bhutan. Travelling with Ornitholidays, the trip was titled “Birds & Buddhism” so that, not only were we looking for Himalayan bird species but also had the opportunity to see and maybe understand the culture & religion of the country. However, with our interest in flowers and particularly Alpines, where better to see them than at 10,000+ feet altitude. 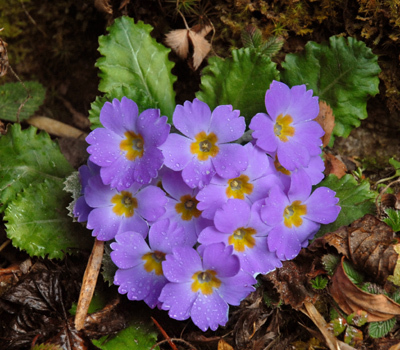 Sadly, we were just a little early for the best displays of wild flowers and especially the Rhododendrons but, while we got a taster of what it might have been 2 – 3 weeks later, we did see carpets of Primula whitei. This picture was taken at 11,000 feet, just below the pass of Dochu La. (An AGS trip to this pass in July 2002 is described in the Bulletin, Vol 72 p 271, but while they were 'overwhelmed' by the diversity of the flora, Primula whitei was long past). High mountain woodland is the typical habitat of P. whitei, which requires cool growing conditions and dislikes hot summers. It is named for Sir Claude White, who found it in 1905. 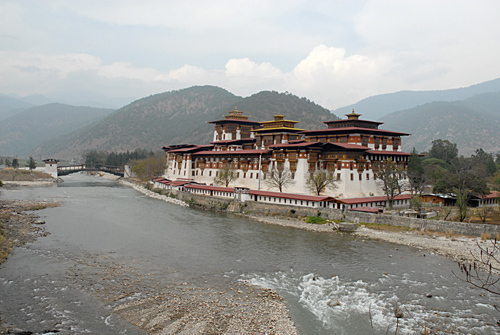 One of the amazing buildings that we saw & visited was the Punakha Dzong. This was in fact the former capital of Bhutan. It was built as a combination of fortress, civic centre & temple.